•	Repairing and replacing marine interiors. This process is very similar to automotive in the concept of upholstery. It can be a small job of replacing a dried out section of material to recreating a completely new boat interior or customizing an interior to match the exterior of a repainted boat. 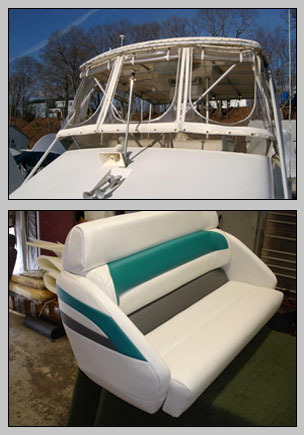 •	Fabricate and repair custom boat tops. This is a custom process. With the exception of a mooring cover, which covers a boat while docked in order to protect it, all other tops should be made to the frame or custom frames made to a specific boat. All of our covers are made of marine grade fabric or vinyl, windows are made with strata glass and boat frames cut and molded from stainless steel tubing. We also repair and re-stitch existing tops as the sun wears the thread faster than the fabric.